Special HUGE huge HUGE thanks to @kchristensen8064 and @Legonch for showing up at 9:30am on a Saturday and helping move the tanks and stands around. I don't like to get all in touch with my emotions and feelings, but one of the greatest aspects of MASC are peoples willingness to lend a hand on a task that isn't particularly fun and can be quite difficult at times. So again thanks, it really means a lot! As for the update, the PVC glue is drying as of a few minutes ago. The old 150g has been sold and is in my garage awaiting a clean out and reseal for new owners. 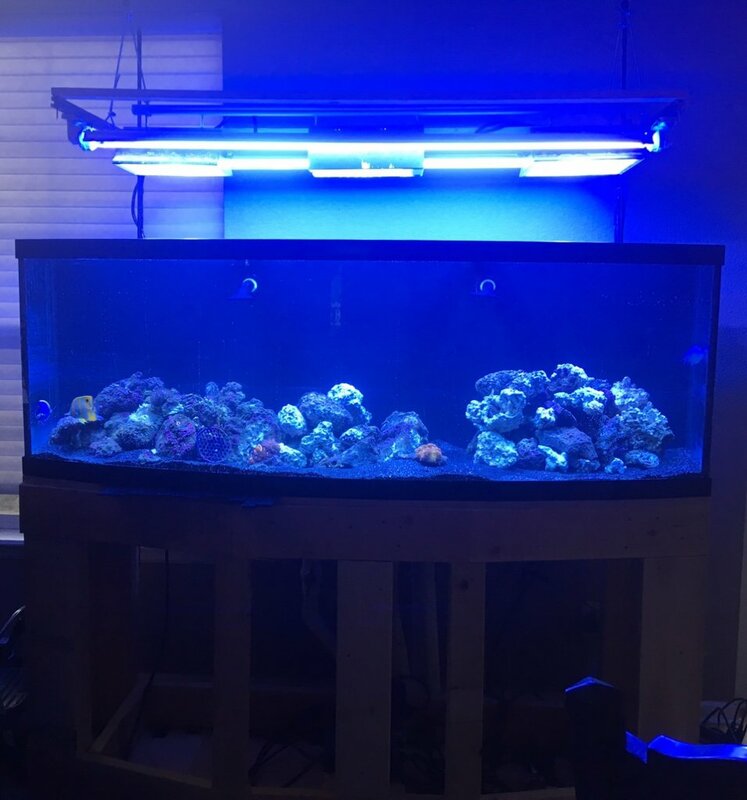 Fish and corals are chillaxing in the living room, I'll probably wait until noon or so on Sunday to begin filling and putting everything back in the 155 bowfront! Haddonisreef, SkyShark, neil82 and 2 others like this. 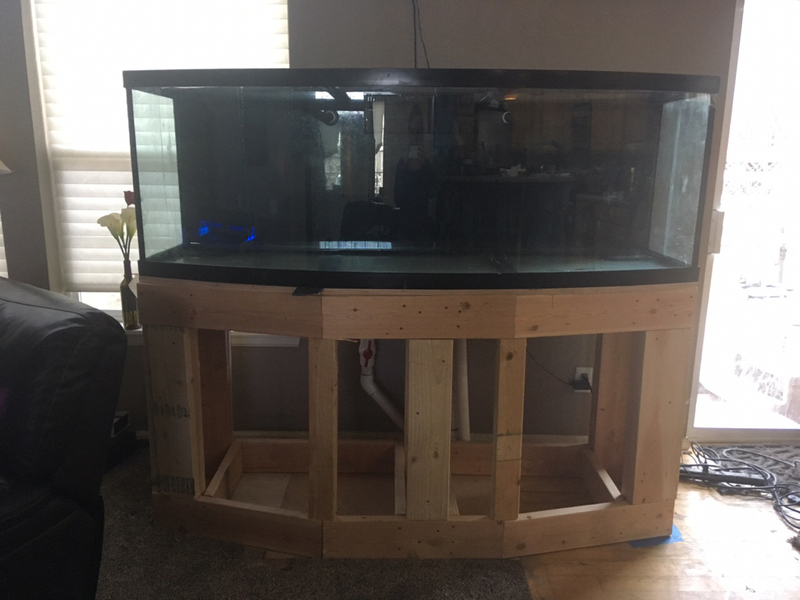 Can't wait to see the new tank with water and life in it! 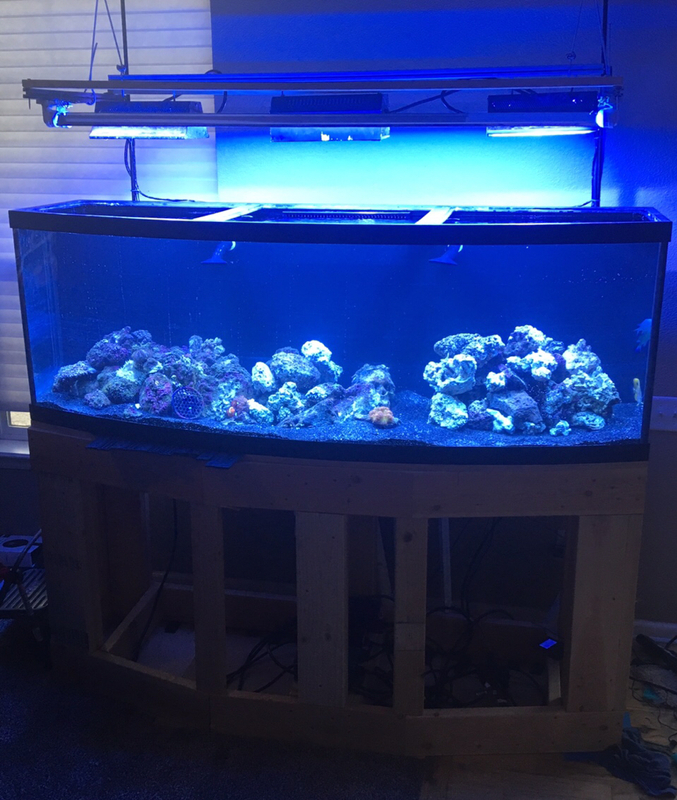 That tank is going to be beautiful! You did a great job on the reseal and the stand. Can’t wait to see it up and running!!! Very cool. MASC buddies to the rescue! flyfish, neil82 and kchristensen8064 like this. I have some ponape birdsnest that broke off last night as soon as you are ready. Looking like it’s comig togeather! Thank you, the rock work leaves a lot to be desired...but I was just working to transfer it in there, I'll need to work on the rocks. 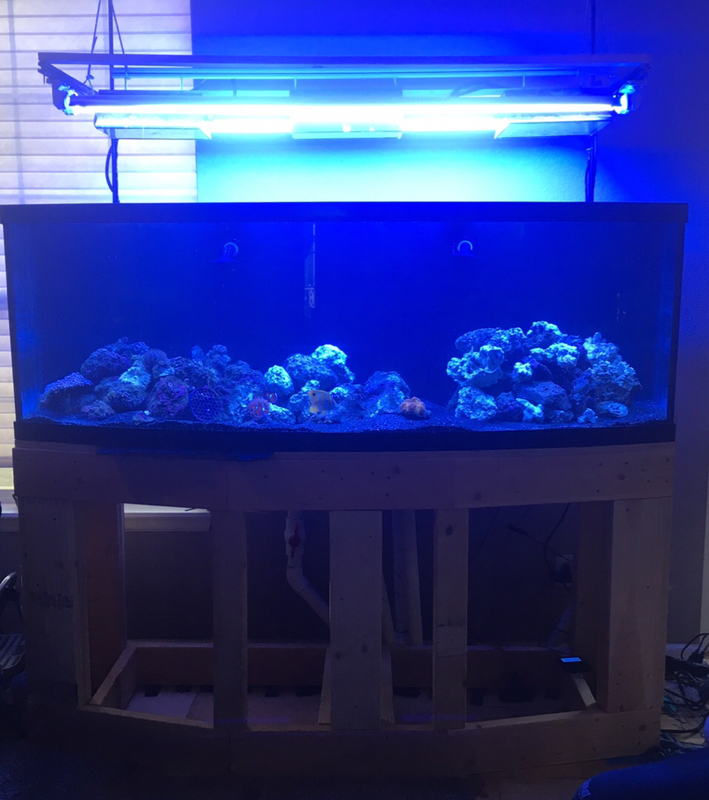 I was more concerned with leak detection, having enough water on hand (which I didn't totally have), making sure the fish all made it, and not totally squashing corals. I have 60 gallons if you need it. The Tank looks great! Are going to be putting any fans on it? I might be, I like the ones that @kchristensen8064 posted that are made for theater cabinets. But we will see today when the MH runs today for their first full 4 hours over the tank. neil82 and JuanGutz like this. The tank looks great! Congrats on the successful move. Thank you again for the MH and ballasts....I still owe you and I haven't forgotten! Looks great! 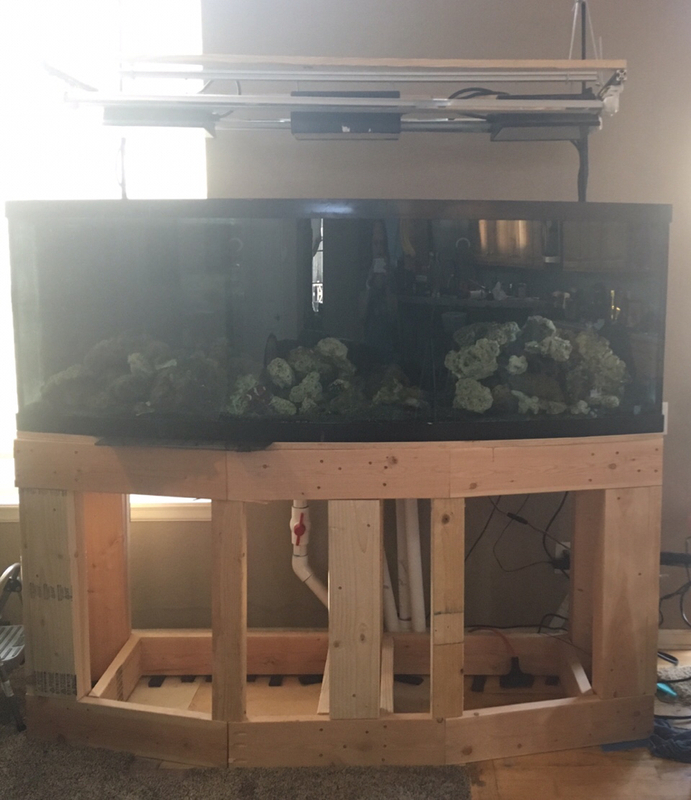 Are you planning on putting a skin on over the stand frame? Maybe magnetic panels or something? I am, I am actually thinking of using that stacked stone stuff that you attach like tiles. And then wood doors on the side what would give access to things like the ballasts. Much to my wife's chagrin, I am going to move my storage of "fish stuff" somewhere else. Although she seems opposed to the dining room table where it is currently, but I think we have a cabinet nearby where I can make some room. kchristensen8064 and Haddonisreef like this. That stuff looks nice. It will get heavy fast though and it might be a bit of a pain to clean too. Salt somehow seems to get everywhere. Something to think about. Lowes apparently has something called LiteStone which is a man made product which is lighter and probably plenty durable. I have to check it out.